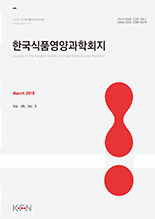 박시향, 홍유미, 최영준, 최진호, 김병관,(2008).자외선 조사 무모쥐 피부조직에 도포한 애엽(Mugwort) 추출물의 주름개선 효과.한국식품영양과학회지,37(9),1136-1141. 무모쥐의 등에 애엽 추출물과 아스코르브산 함유 스킨로션을 도포하고 자외선을 조사하여 애엽 추출물과 아스코르브산의 주름 개선 효과를 알아보았다. 애엽 추출물 도포군의 피부조직 두께는 대조군에 비해 12.5～21.4%의 유의적인 감소 효과를 보였다. 표면 거칠기 측정기에 의한 피부 주름의 형성 정도를 측정하는 지표인 Ra값은 ME-1.0, ME-2.0과 ME-5.0 도포군에서 23.7～31.1%로 유의적으로 감소하였고 (p＜0.01), Rq치는 ME-1.0, ME-2.0와 ME-5.0에서 11.2～21.2%, Rz의 측정치에서는 ME-1.0(19.8%), ME-2.0(22.1%), ME-5.0(24.5%) 그룹에서 대조군에 비해 크게 감소하였다. Rt치는 ME-1.0, ME-2.0와 ME-5.0 그룹에서 농도 증가에 따라 14.2%에서 22.7%의 유의적인 감소효과가 있었다. 아스코르브산 도포그룹은 애엽과 비슷한 감소효과를 보여주었지만, 애엽의 주름 개선효과에는 미치지 못하였다. MMP-1 활성은 애엽 메탄올 추출물 그룹에서 19.3%～22.6%까지 감소하였고, 콜라겐의 생성은 ME-2.0과 ME-5.0그룹에서 10% 정도의 유의적인 증가 효과가 있었다. 이처럼 애엽 메탄올 추출물은 피부의 광손상에 대한 피부 보호 및 피부의 주름 개선효과가 탁월하고, 또한 강력한 항산화제인 아스코르브산보다 그 효과가 우수하여 피부노화 현상과 주름 개선을 위한 기능성 화장품 소재로 이용가치가 있을 것으로 여겨진다. This study was to investigate antiwrinkle effect of mugwort (Artemisia vulgaris) methanol extract in hairless mouse skin induced by UVB-irradiation. Hairless mouse were topically treated with the basic lotion alone (control), ascorbic acid (AA-0.5%, AA-1.0%, AA-2.0%, and AA-5.0%) and mugwort extract (ME-0.5%, ME-1.0%, ME-2.0%, and ME-5.0%) dissolved in a basic lotion. After topical treatment of 30 minutes, the animals were irradiated with increasing doses of UVB radiation (60～100 mJ/㎠) for 4 weeks. In our experimental condition, skin thickness of hairless mouse was significantly decreased (12.5～21.4%) in all ME groups compared with control group. Ra value, that is surface roughness parameter induced by skin wrinkling, was significantly decreased (23.7～31.1%) in ME-1.0%, 2.0% and 5.0% group compared with control group. Furthermore, Rq, Rz and Rt value were significantly decreased to 11.2～21.2%, 19.8%～24.5%, and 14.2%～22.7%, respectively. Wrinkle formation of ascorbic acid treatment group as reference group was inhibited, but its effect was less than ME treatment. Matrix metalloproteinase-1 activity was significantly inhibited (19.7～22.6%) compared with control group and collagen content was significantly increased (about 10%) when compared with control group. These results indicate that ME could protect skin aging and wrinkle formation in hairless mouse from photo-irradiation.